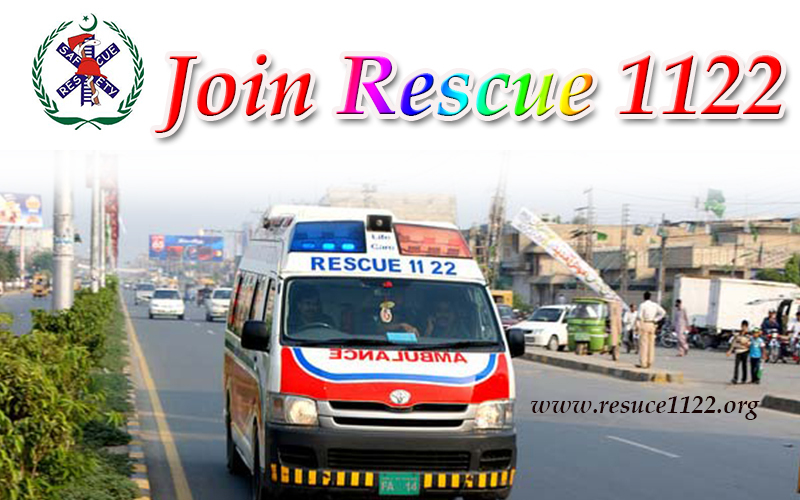 Now Join Government of Gilgit -Baltistan Emergency Services Rescue 1122 jobs to help humanity in real life taste with huge salary packages. The Staff is Required for GILGIT-BALTISTAN EMERGENCY SERVICES Rescue 1122 having the domicile of Gilgit Baltistan in all upper scales and low scales. These jobs are On Contract Basis and mostly extendable if the performance if good. For Gilgit Division / Skardu Division/Diamer Division jobs details are here. 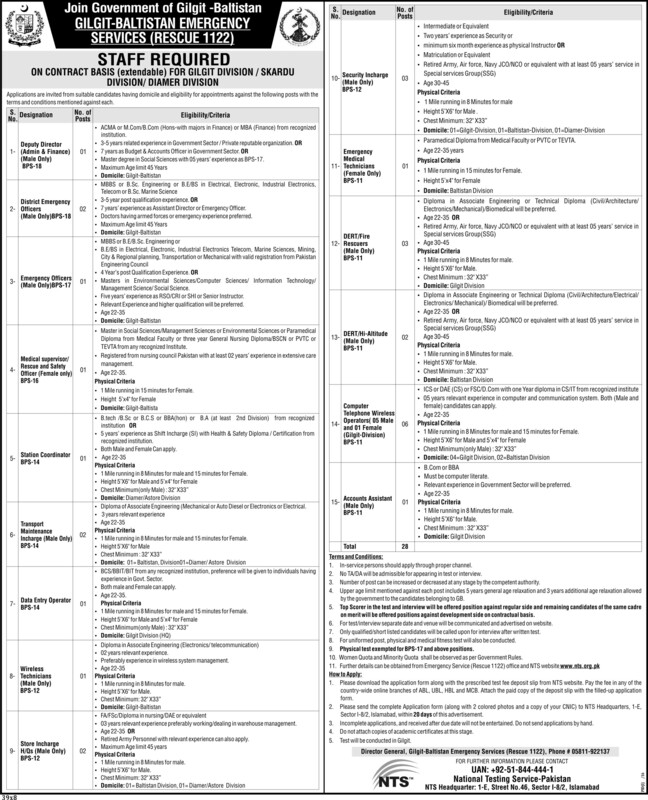 The new jobs 2016 of Deputy Director (Admin & Finance) , District Emergency Officers, Emergency Officers, Medical supervisor/ Rescue and Safety Officer , Station Coordinator , Transport Maintenance Incharge , Data Entry Operator , Wireless Technicians , Store Incharge , Security Incharge, Emergency Medical Technicians , DERT/Fire Rescuers, DERT/Hi-Altitude , Computer Telephone Wireless Operators and Accounts Assistant are announced for the educated candidates having good skills for their respective designation. Applications are invited from suitable candidates having domicile and eligibility for appointments against the following posts with the terms and conditions mentioned against each. 1- Deputy Director (Admin & Finance) (Male Only) BPS-18 01 ACMA or M.Com/B.Com (Hons-with majors in Finance) or MBA (Finance) from recognized institution. Master degree in Social Sciences with 05 years’ experience as BPS-17. 7 years’ experience as Assistant Director or Emergency Officer. Doctors having armed forces or emergency experience preferred. Masters in Environmental Sciences/Computer Sciences/ Information Technology/ Management Science/Social Science. Five years’ experience as RSO/CRI or SHI or Senior Instructor. Relevant Experience and higher qualification will be preferred. 4- Medical supervisor/ Rescue and Safety Officer (Female only) BPS-16 01 Master in Social Sciences/Management Sciences or Environmental Sciences or Paramedical Diploma from Medical Faculty or three year General Nursing Diploma/BSCN or PVTC or TEVTAfrom any recognized Institute. Registered from nursing council Pakistan with at least 02 years’ experience in extensive care management. 1 Mile running in 15 minutes for Female. 5 years’ experience as Shift Incharge (SI) with Health & Safety Diploma / Certification from recognized institution. 1 Mile running in 8 Minutes for male and 15 minutes for Female. 6- Transport Maintenance Incharge (Male Only) BPS-14 02 Diploma of Associate Engineering (Mechanical or Auto Diesel or Electronics or Electrical. 7- Data Entry Operator BPS-14 01 BCS/BBIT/BIT from any recognized institution, preference will be given to individuals having experience in Govt. Sector. Preferably experience in wireless system management. 1 Mile running in 8 Minutesfor male. 03 years relevant experience preferably working/dealing in warehouse management. Retired Army Personnel with relevant experience can also apply. 1 Mile running in 8 Minutes for male. 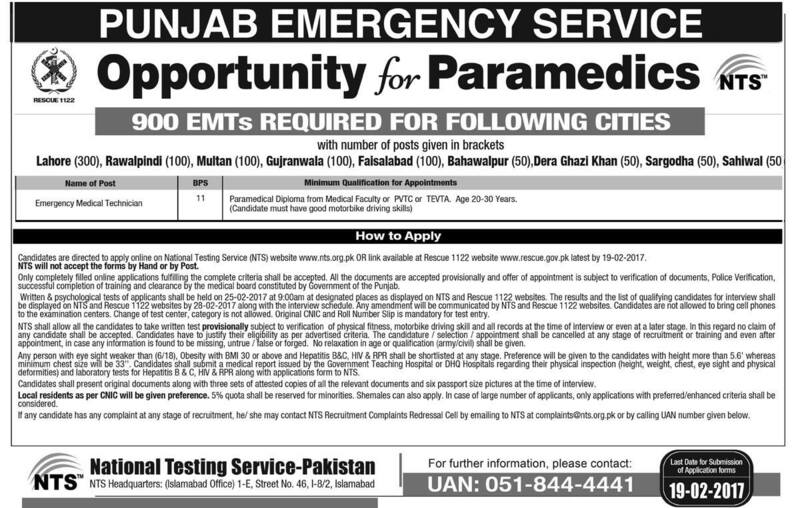 11- Emergency Medical Technicians (Female Only) BPS-11 01 Paramedical Diploma from Medical Faculty or PVTCorTEVTA. 12- DERT/Fire Rescuers (Male Only) BPS-11 03 Diploma in Associate Engineering or Technical Diploma (Civil/Architecture/ Electronics/Mechanical)/Biomedical will be preferred. 13- DERT/Hi-Altitude (Male Only) BPS-11 02 Diploma in Associate Engineering or Technical Diploma (Civil/Architecture/Electrical/ Electronics/ Mechanical)/ Biomedical will be preferred. 05 years relevant experience in computer and communication system. Both (Male and female) candidates can apply. 1 Milerunningin8 Minutes for male and 15 minutes for Female. Relevant experience in Government Sector will be preferred. In-service persons should apply through proper channel. No TA/DA will be admissible for appearing in test or interview. Number of post can be increased or decreased at any stage by the competent authority. Upper age limit mentioned against each post includes 5 years general age relaxation and 3 years additional age relaxation allowei by the government to the candidates belonging to GB. Top Scorer in the test and interview will be offered position against regular side and remaining candidates of the same cadri on merit will be offered positions against development side on contractual basis. For test/interview separate date and venue will be communicated and advertised on website. Only qualified/short listed candidates will be called upon for interview after written test. For uniformed post, physical and medical fitness test will also be conducted. Physical test exempted for BPS-17 and above positions. Women Quota and Minority Quota shall be observed as per Government Rules. Please download the application form along with the prescribed test fee deposit slip from NTS website. Pay the fee in any of thi country-wide online branches of ABL, UBL, HBL and MCB. Attach the paid copy of the deposit slip with the filled-up applicatioi form. Please send the complete Application form (along with 2 colored photos and a copy of your CNIC) to NTS Headquarters, 1-E Sector I-8/2, Islamabad, within 20 days of this advertisement. Incomplete applications, and received after due date will not be entertained. Do not send applications by hand. Do not attach copies of academic certificates at this stage. Test will be conducted in Gilgit.